(Reuters) - Greek leftwing leader Alexis Tsipras struck a deal with a right-wing party to form a government to confront international lenders and reverse years of painful austerity following a crushing election victory by his Syriza party. The success of the anti-bailout party reignites fears of new financial troubles in the country that set off the regional crisis in 2009. It is also the first time a member of the 19-nation zone will be led by a party rejecting German-backed austerity, emboldening anti-austerity movements elsewhere. Fresh from trouncing conservative Prime Minister Antonis Samaras on a campaign of "Hope is coming! ", the 40-year-old Tsipras quickly sealed a deal on a coalition with the head of the small Independent Greeks party which, like Syriza, opposes Greece’s bailout deal. "From this moment there is a government in the country. 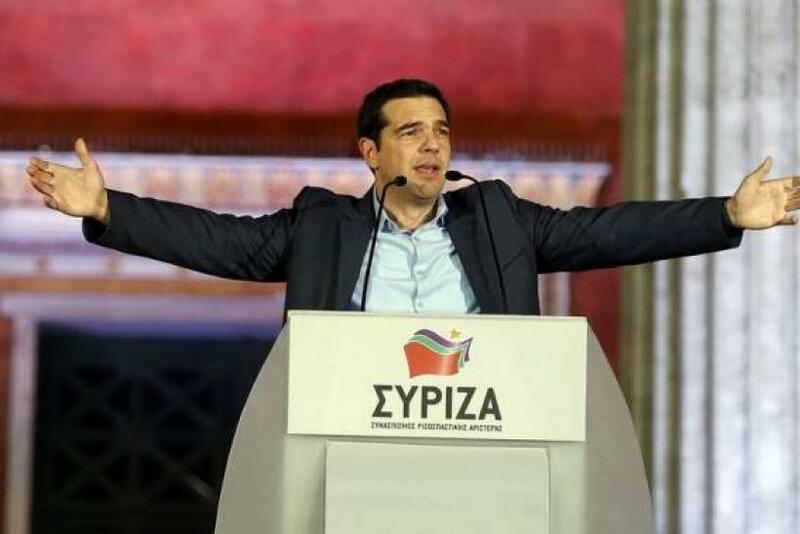 The Independent Greeks give a vote of confidence in Prime Minister Alexis Tsipras. There is an agreement in principle," Panos Kammenos said after talks with Tsipras at Syriza's headquarters in Athens. A deal with the right-wing party makes an unusual alliance between parties on the opposite end of the political spectrum but brought together by a mutual hatred for the EU/IMF bailout program keeping Greece afloat. Reaction from financial markets to Syriza's victory was largely muted, with the euro recovering from a tumble to an 11-year low against the dollar on initial results. Greek stocks dipped slightly while 10-year bond yields rose. With almost all votes counted, Syriza won 149 seats in the 300-seat parliament, two short of an absolute majority. But the result marked a comprehensive rejection of the years of austerity demanded by the European Union and International Monetary Fund in return for the 240 billion-euro bailout. Syriza's campaign of hope resonated with voters worn down by huge budget cuts and heavy tax rises during the years of crisis that have sent unemployment over 25 percent and pushed millions into poverty. "Greece leaves behind catastrophic austerity, it leaves behind fear and authoritarianism, it leaves behind five years of humiliation and suffering," Tsipras, pumping his fist in the air, told thousands of cheering supporters in Athens on Sunday. Tspiras will be creating the first euro zone government elected to undo the orthodox conservative polices of strict budgetary rigor that German Chancellor Angela Merkel has championed for the bloc's most troubled economies although he has not laid out what his first moves in office would be. For the first time in more than 40 years, neither the New Democracy party of Samaras nor the centre-left PASOK, the two forces that had dominated Greek politics since the fall of a military junta in 1974, will be in power. Tsipras also expects to talk to the heads of two other parties, the centrist To Potami and the communist KKE, a sign he may look for their support even if they do not join a formal coalition. The Independent Greeks, a rightwing party with a hardline stance against illegal immigration, disagrees with Syriza on many social issues which could create tensions but it shares its opposition to the international bailout. An alliance between the two sides would suggest a hardline stance against Greece's creditors, who have dismissed Tsipras's demands for a debt writeoff and insisted the country stay on the path of reforms and austerity to get its finances back on track. Hours after Syriza's victory, ECB Executive Board member Benoit Coeure said that Greecehad to pay its debts and warned Tsipras to play by the "European rules of the game". "There is no room for unilateral action in Europe, that doesn't exclude a discussion, for example, on the rescheduling of this debt," Coeure told Europe 1 radio. Together with last week's decision by the ECB to pump billions of euros into the euro zone's flagging economy despite objections from Germany, Syriza's victory marks a turning point in the long euro zone crisis. But after the euphoria of election night, hailed by flag-waving crowds in Athens, Tsipras faces daunting challenges and can expect strong resistance to his demands from Germany in particular. With Greece unable to tap the markets because of sky-high borrowing costs and facing about 10 billion euros of debt payments this summer, he will have to seek a deal to unlock more than 7 billion euros of outstanding aid by the time the bailout is due to expire on Feb. 28. However, Syriza's victory will also encourage other anti-austerity forces in Europe and add impetus to calls for a change of course away from the focus on budget belt-tightening and structural reform favored by Berlin. Those calls have come not just from anti-system movements such as Podemos in Spain but also from leaders such as French President Francois Hollande, who congratulated Tsipras on his win, and Italian Prime Minister Matteo Renzi.